From your new TV crush Harvey Kinkle to the ever so slightly terrifying Weird Sisters, here's 10 brand new and exclusive stills from Netflix's 'Chilling Adventures Of Sabrina' - dropping on October 26th. Zelda Spellman (Miranda Otto) is Sabrina’s sterner witch aunt. Proud and devout, Zelda believes there is no greater honour than serving the Dark Lord as a member of the Church of Night. She is the family’s disciplinarian, fiercely protective of Sabrina, and very much Cain to Hilda’s Abel. Hilda Spellman (Lucy Davis) is one of Sabrina’s two witch aunts. More nurturing than Zelda, Hilda’s motherly nature and warm sense of humour belie a wicked, ghoulish streak. She is as adept at brewing spite jars against her family’s enemies as she is at concocting love potions for the students at Baxter High. Mary Wardwell or Madam Satan (Michelle Gomez) is Sabrina’s favourite teacher and mentor at Baxter High. When she is possessed by the Devil’s handmaiden, Madam Satan, Ms. Wardwell turns into a sultry, cunning manipulator, always trying to lure Sabrina down the Path of Night. Ambrose Spellman (Chance Perdomo) is Sabrina’s warlock cousin from England. Placed under house-arrest by the Witches Council, Ambrose is forbidden from leaving the funeral home where he lives with the Spellman women. Witty, puckish, and pan-sexual, he is one of Sabrina’s partners in crime, always up for mischief. 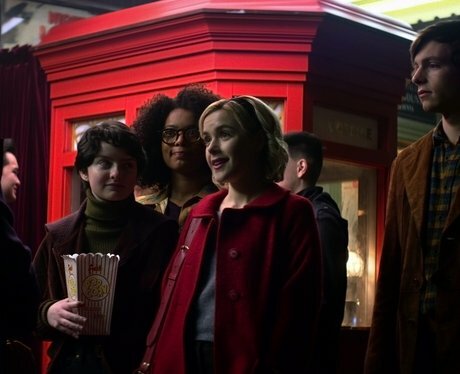 Sabrina's friends, Rosalind Walker (Jaz Sinclair), the brash, empowered and outspoken daughter of Greendale's minister and Sabrina's best friend at Baxter High, and Susie Putnam (Lachlan Watson) one of Sabrina’s friends at Baxter High and a founding member of the school’s newly formed WICCA club. Brave and optimistic despite being bullied at school, Susie lives on a farm at the outskirts of town and deals with a terrifying supernatural threat at home. The Weird Sisters; Agatha (Adeline Rudolph), Prudence (Tati Gabrielle) and Dorcas (Abigail Cowen) are a trio of powerful, uncanny teenage witches at the Academy of Unseen Arts who look down their noses at Sabrina for being half-mortal.